Take time out from playing Santa and do yourself and family a favor and read this series at PDN on Holiday Safety. 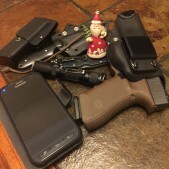 It is a three part series with GN's Grant Cunningham penning the first installment, Paul Carlson (GN's "The Blade") and Derick Poole, proprietor of Echo-5 Training Group, with the third. Take the steps to be safe over the holidays.